Chickenpox is so well known in general practice that it is rarely seen in hospital clinics and is sometimes not recognised. The prodromal illness lasts one to two days and is followed by erythematous lesions that rapidly develop vesicles, then pustules, followed by crusts in two to three days. Crops of lesions develop at the same sites—usually on the trunk, face, scalp, and limbs. The oral mucosa may be affected. The condition is usually benign. Dermatitis herpetiformis occurs in early and middle adult life and is characterised by symmetrical, intensely itching vesicles on the trunk and extensor surfaces. The vesicles are superficial. The onset is gradual, but may occur rapidly. The distribution is shown in the diagram. 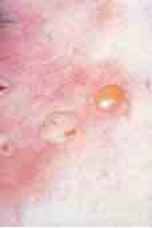 Variants of dermatitis herpetiformis are larger blisters forming bullae and erythematous papules and vesicles. disease is a more severe, widespread disease, in which there are "linear" deposits of lgA along the basement membrane of the epidermis and not only at the tips of the papillae as in dermatitis herpetiformis. Treatment is with dapsone or sulfapyridine together with a gluten free diet. Blisters can occur on the lesions of erythema multiforme to a variable degree; when severe, generalised, and affecting the mucous membranes it is known as Stevens-Johnson syndrome. The typical erythematous maculopapular changes develop over one to two days with a large blister (bulla) developing in the centre of the target lesions. In severe progressive cases there is extensive disease of the mouth, eyes, genitalia, and respiratory tract. The blisters are subepidermal, although some basement membrane remains on the floor of the blister. 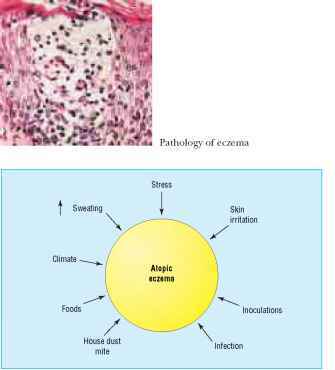 As the name implies lichenified papules are the main feature of pityriasis lichenoides varioliformis acuta (or Mucha-Habermann disease), but vesicles occur in the acute form. Crops of pink papules develop centrally, with vesicles, necrosis, and scales—resembling those of chickenpox—hence the "varioliformis". There is considerable variation in the clinical picture, and a prodromal illness may occur. The condition may last from six weeks to six months. No infective agent has been isolated. The pathological changes parallel the clinical appearance with inflammation around the blood vessels and oedema within the dermis. The bullous type of pemphigoid is a disease of the elderly in which tense bullae develop rapidly, often with a preceding erythematous rash, as well as on normal skin. It is mainly seen in the elderly and is slightly more common in women.The flexural aspects of the limbs and trunk and flexures are mainly affected. The bullae are subepidermal and persistent, with antibodies deposited at the dermo-epidermal junction. Unlike pemphigus there is a tendency for the condition to remit after many months. Another type of pemphigoid occurs in which there is scarring of the oral mucous membrane and the conjunctiva. Occasionally localised lesions are seen on the legs with evidence of an immune reaction, but often the absence of circulating antibasement membrane antibodies. This is a relatively benign condition and often responds to topical steroids. Treatment is with corticosteroids by mouth, 40-60 mg daily in most patients, although higher doses are required by some. Azathioprine aids remission, with reduced steroid requirements, but takes some weeks to produce an effect. It is essential to check the serum thiopurine methyl transferase (TPMT) level before starting treatment. Patients with low levels have impaired ability to metabolise azathioprine and are likely to suffer toxic effects. Topical steroids can be used on developing lesions. Chronic scarring pemphigoid affects the mucous membranes with small bullae that break down, leading to erosions and adhesions in the conjunctivae, mouth, pharynx, and genitalia. The most common form of pemphigus vulgaris is a chronic progressive condition with widespread superficial bullae arising in normal skin. In about half of the cases this is preceded by blisters and erosions in the mouth. The bullae are easily broken, and even rubbing apparently normal skin causes the superficial epidermis to slough off (Nikolsky sign). These changes are associated with the deposition of immunoglobulin in the epidermal intercellular spaces. It is a serious condition with high morbidity, despite treatment with steroids and azathioprine. Pemphigus vegetans and pemphigus erythematosus are less common variants.